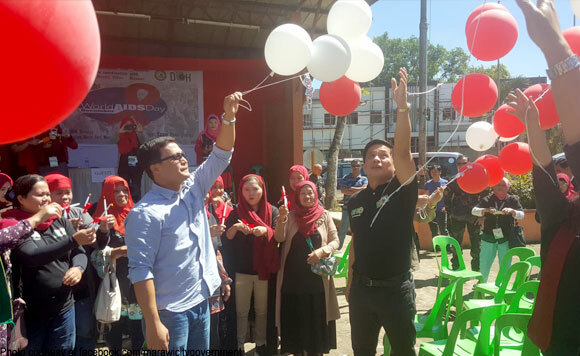 Marawi City Mayor Majul U. Gandamra has underscored the importance of combating the adverse effects of human immunodeficiency virus infection and acquired immune deficiency syndrome (HIV/AIDS). This as he led the commemoration of the World AIDS Day Monday, December 3, instead of December 1, which fell on a Saturday. Although originally being observed every 1st of December, the city government decided to hold the event on another date to ensure maximum attendance during the event. “AIDS knows no religion. It knows no tribe. Wala siyang sinasanto. And the fact that it can happen to anyone makes it scary to the point that people will believe the wrong information about it,” he said. “Kung pag-aaralan natin kung paano ito nagsimula at kumalat sa buong mundo, at kung aalamin natin kung paano ito iwasan, at kung isusulong po natin ang pagpapasuri at pagpapagamot ng mga taong may AIDS, mas matututunan po nating maiwasan ito,” Gandamra explained.